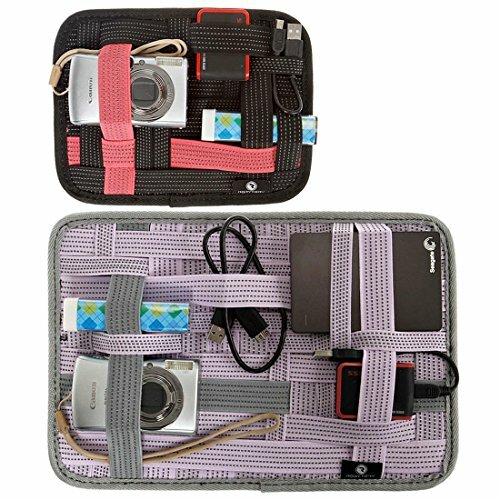 Create your own storage systems with these uniquely designed, elastic band grid organizers. The lightweight bands are made with durable elastic and feature anti-slip texture to help grip your items. They are interwoven to create numerous possibilities to store and organize a variety of items - from electronic items to make-up/beauty accessories. The board is ultra slim to help save space and great for use in backpacks, computer bags, purses, briefcases, and more. Also, if you need more space, the back of each board features a zippered pocket for additional storage and smaller items (large board has a 10 inch pocket, small board has a 5.5 inch pocket). If all that wasn't enough, the boards also feature a small material band so that you can hang these organizers for use around the house. These items will go a long way in helping to clean the clutter from your life. *NOTE*: Due to differences between monitor displays, actual color may vary slightly from image. RoryTory is a registered trademark of Remi Collections LLC and is exclusively distributed by Bundle Monster. The RoryTory trademark is protected by US Trademark Law. LIGHTWEIGHT - feature non-slip texture to help grip your items. PORTABLE SIZE - Large - 12.4 in (L) X 8.5 in (W). Small - 8.5 in (L) X 6.5 in (W) both 0.3 inches thick. If you have any questions about this product by RoryTory, contact us by completing and submitting the form below. If you are looking for a specif part number, please include it with your message.